American studio ODA has taken cues from New York's historic character while designing this apartment block, which aims to "combat the cold modernism of so much contemporary construction". 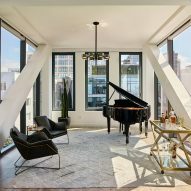 Called 15 Renwick, the luxury condominium building is located on a secluded street near Soho, and is surrounded by low-scale structures faced with brick and stone. "Renwick Street is a rare blip on the vast urban grid: a small, single-block residential enclave, whose self-generated hush recalls the era of a much more intimate Manhattan," said ODA, a New York-based architecture firm. While conceiving the 11-storey apartment block, the architects sought to capture the area's historic character. They also wanted to stray from the trend toward erecting hermetic "crystal towers" in New York. The street-facing elevation has a gridded facade made of charcoal-hued aluminium. Thick frames around windows help block views into the apartments, helping increase privacy. 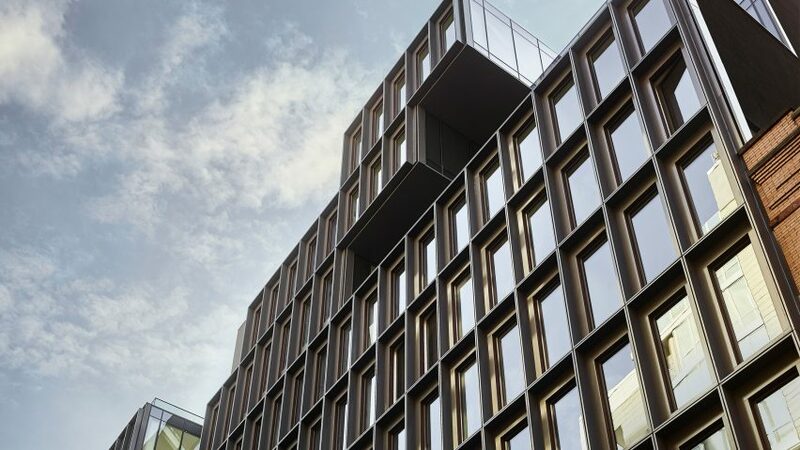 The base of the building is wrapped with copper panels, which "feel more like they belong to a private suburban home than any typical urban condominium". For the upper portion, the firm broke up the massing to form glass-walled terraces and floating boxes. The scheme was a clever solution to a zoning requirement related to dormers, which limits how much square footage can protrude from the facade. "By reinterpreting the rule, ODA was able to dissect and redistribute Renwick's upper massing, opening large geometric pockets for private terraces," the studio said. In total, the outdoor terraces encompass 8,300 square feet (771 square metres). Many offer views of the Hudson River and the New Jersey waterfront. 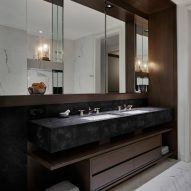 Inside, rich wood panelling and marble detailing were used in the common areas. The lobby is enclosed within black walls and features a tufted-leather reception desk. "A nod to James Renwick himself – the English-American scientist and engineer for whom Renwick Street was named – interior common spaces channel the warmth and intimacy of an early British social club," the studio said. "Taken together with Renwick's creatively wrought outdoor space, these elements combine to combat the cold modernism of so much contemporary construction, which tends to seal residents in nondescript boxes, up and away from each other." The building contains 31 condominium units, with prices ranging from $2 million to $10.5 million (£1.6 million to £8.3 million), reports Curbed. 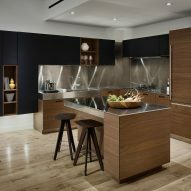 Images of a residential unit show a neutral colour palette, wooden flooring and contemporary decor. Other New York projects by ODA include a "pixelated" luxury condo building in Queens and a proposal for a trio of irregularly stacked, waterfront towers in Brooklyn. Photography is by Frank Oudeman.